Facial plastic surgeries and face lifts reverse wrinkles and aging in your face and neck. Over time, sun damage, stress, pollution, facial animation, and gravity can weather your face and neck. You might be experiencing deep creases in the corners of your mouth, a jowly jaw line, or your neck might develop wrinkles and pockets of fat. Dr. Gary Takowsky in Beverly Hills is an experienced facial plastic surgeon, committed to reversing visible signs of aging. He uses a variety of face lifts techniques that will make you look younger, healthier, and more attractive. At Gary Takowsky, MD, we assess your facial structure and target exact areas, helping you reach your individual image goals. Facelifts are often done in conjunction with brow lifts and eyelid surgery (blepharoplasty). While face lifts can make you look 10 -15 years younger, it is important to remember that face lifts cannot prevent the aging process. Overtime, your face may see signs of aging again - in which case, we can easily rejuvenate the area with facial fillers. Should You Get a Face Lift? Facelifts can give you the boost of confidence you need to not only look, but feel younger, healthier, and more lively. Who is a Good Face Lift Candidates? While facelifts are a relatively simple surgery, some patients may not be candidates for this surgery. Patients with certain medical conditions also might not be eligible for facelifts, especially those that are prone to infection. If you smoke, you will need to stop at least two months prior to surgery and two months after. It is a good idea to quit smoking altogether, since smoking destroys your skin elasticity and causes premature wrinkles. If you have weak bone structure, you might think about complementary dermal fillings or facial implants to enhance your structure and tighten skin. It is important to have realistic expectations based on the limitations of facelift surgery and your individual conditions. Don’t forget to talk to Dr. Takowsky about your cosmetic goals, before electing for a facelift surgery. What is the Best Age for Face Lift Surgery? As we mentioned earlier, for a facelift to be successful, you will still need some skin elasticity. The majority of patients who undergo rhytidectomy are between the ages of 40 and 70. At the same time, it is still possible for patients over 70 to see success from facelifts. Before moving forward with a treatment plan, Dr. Takowsky will evaluate your skin to decide the best technique, or if you are ineligible for the treatment. Dr. Takowsky uses a range of face lift techniques, depending on your facial anatomy, cosmetic goals, and the amount of time you have for recovery. The degree of invasiveness in a facelift will depend on the type of incision, the number of treated tissue layers, and the targeted area of the face. A traditional facelift, sometimes called a standard facelift, is a good option for treating medium to severe stages of aging in your mid-face and neck. Traditional facelifts require more recovery time than a mini-facelift, but the results are desirable. Standard facelifts are performed by making an incision behind the hairline, beginning at the temples and around the front of your ear, thus naturally hiding the incision. Then, we can reposition the deeper tissues under the skin, remove extra skin to smooth out wrinkles, which gets rid of fatty jaws and sagging under the chin. Patients with slight degrees of aging, mild jowling and loose skin are better suited for mini facelifts. Mini facelifts are a less invasive way of tightening your underlying facial tissue. Like the traditional facelift, incisions are made around the hairline and around the natural folds of the ears. Mini facelifts use smaller incisions than traditional facelifts to lift the cheeks and correct sagging jowls. Mini facelifts will leave your face less tired looking with a more defined jawline. This type of facelift allows you to treat signs of aging before they get out of hand and need more expansive surgeries in the future. 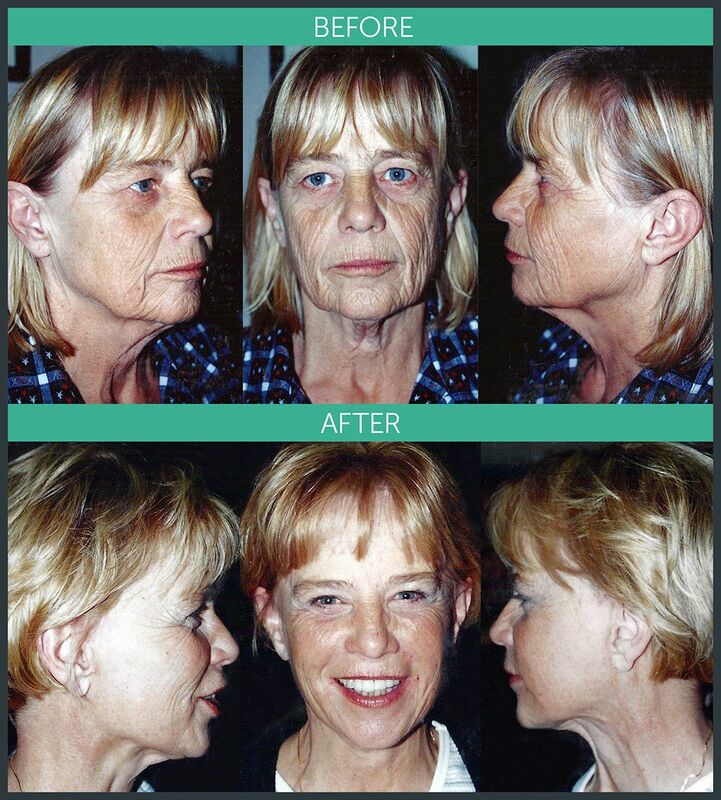 Deep plane lifts are considered the highest quality facelift. This treatment technique allows you to lift and reposition your superficial musculoaponeurotic system, also known as SMAS. The SMAS layer is a layer of tissue under the skin and around the muscles that control facial expressions. Deep plane lifts are common in patients with dramatic facial sagging and loose skin. They are also common for patients looking for a longer-lasting lift, since the results can last for up to 15 years. Results of a deep plane lift are especially visible in the cheeks, nasolabial folds, jawline, and chin. For patients with increased sagging around their cheeks, nose, and mouth, midface lifts are a good technique. For this technique, incisions are made at the hairline and inside your mouth. Then, the fatty layers of your mid face will be repositioned over your cheekbones. This technique can be performed with deep plane lifts or by itself. Sometimes isolated cheek lifts will be done endoscopically, through the lower eyelid, or at the same time as eyelid surgery. Midface lifts have few risks and short downtimes. Oftentimes, the term “facelift” is used interchangeably with eyelid surgery. Eyelid surgery is not a part of a facelift, but it is often performed alongside of a facelift. If you suffer from droopy, puffy, or saggy eyelids that look worn out, blepharoplasty is a surgery that fixes drooping eyelids by removing skin, muscle, or fat. As you get older, the muscles around your eyelids get weaker, and your eyelids begin to stretch. Drooping eyelids can negatively affect your vision, as well as make you look older. Blepharoplasty is typically done in conjunction with a browlift or facelift but can also be performed by itself. You can learn more about the ins and outs of eyelid surgery here. The length of your recovery time for your facelift will be determined on the type of facelift you receive, if there are any complementary treatments, and how well you take care of yourself after the treatment. Day of the procedure: After surgery, you can expect to have bandages on your face, and some swelling and discomfort, which can be controlled with over-the-counter or prescription medication. The first week: For a healthy recovery, you should avoid strenuous activities. Try to have some light activity, like walking around the room to get your blood flowing and prevent clots. About 5-7 days after surgery, you will return to have your stitches removed. After the first week: You can expect swelling and bruising for a few weeks after your facelift. A lot of people feel healed enough to resume activities about two weeks after their surgery. However, you should avoid heavy lifting, pools, hot tubs, alcohol, makeup, and aspirin. You should also sleep with your head elevated for two weeks after surgery. Full recovery: Make sure that you attend all of your follow-up appointments with Dr. Takowsky, so we can carefully assess your progress and prevent complications. As your swelling subsides, you will begin to look younger and less droopy. It is understandable that you will want to do some research before choosing a plastic surgeon for your facelift. Choosing an inexperienced or unqualified cosmetic surgeon leads you to a higher risk of infections, complications, and unnatural-looking results that will end up costing you more to fix in the future. When it comes to choosing the right plastic surgeon for your face lift, there are some factors you should keep in mind, like: education, certifications and memberships, experience, and before-and-after pictures. Dr. Gary Takowsky in Beverly Hills has performed countless face lift surgeries with successful results. He practices patient-centered plastic surgery through open communication, comprehensive consultations, and compassionate care. Schedule a consultation today at 323-676-0222.